Saturday March 11th Lincoln parents, friends, and staff are invited to the Annual Trivia Party. 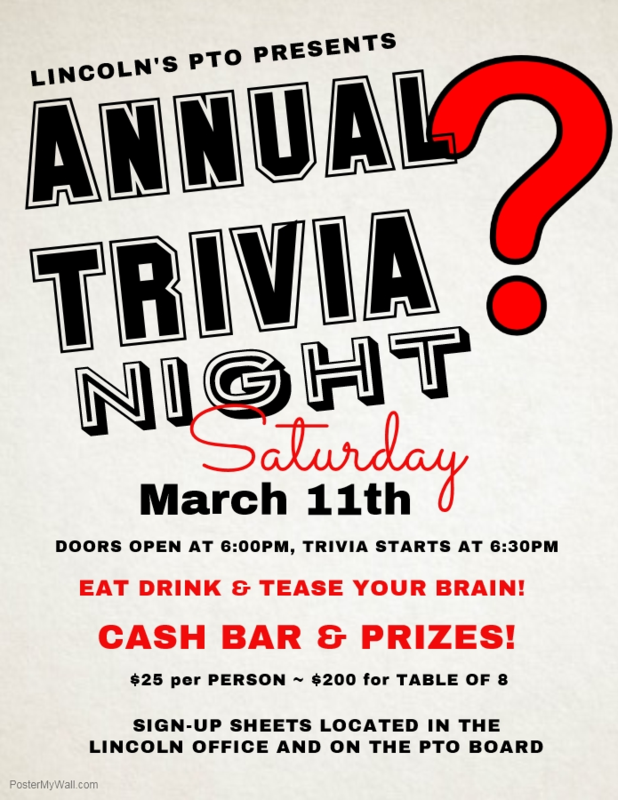 This fun-filled, adults-only event features trivia for everyone! Test your knowledge of: arts, food, geography, history, movies, music, politics, pop-culture, science, sports, TV, and more! All while supporting Lincoln school! Year after year one of our greatest FUNdraisers! Cash bar. Prizes. Teamwork. Fun! 8 people per table. $25/person, $200/table. Get together a team of grade-level parents, neighbors, friends, or sign up as an individual. Individuals will be grouped into teams of 8. • Checks to office, payable to the Lincoln School PTO.